It has been a challenge to find a recipe for brussels sprouts that wouldn’t bring out those “looks” on the face of my family members. It has been a challenge to find a recipe for brussels sprouts that wouldn’t bring out those “looks” on the face of my family members…well, I think I have found it. I found this recipe in a Taste of Home cookbook and decided to try it one evening. Although noses were being wrinkled and all I could get was a promise to “try” it, I noticed that when I cleared the table the bowl was empty…not a brussels sprout to be found. Now is the best time of year to get brussels sprouts fresh from the field. Hope you find this recipe family friendly. Cut an “X” in the core of each brussels spout. Place in a large saucepan, add 1 inch of water. Bring to a boil. Reduce heat; cover and simmer for 8-10 minutes or until vegetables are crisp tender. Meanwhile, in a large ovenproof skillet, cook bacon over medium heat until crisp. Using a slotted spoon, remove to paper towels; drain, reserving 2 tablespoons drippings. Saute onion in drippings until tender. Stir in the vinegar, mustard, garlic powder, salt, brussels sprouts and bacon; cook 2-3 minutes longer. 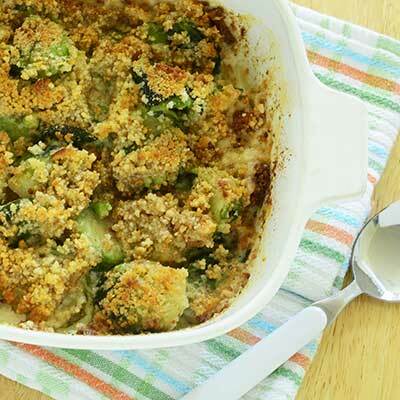 Sprinkle with bread crumbs; broil 4-6 inches from the heat for 2-3 minutes or until golden brown.